Looks like airline passengers coming to the new KLIA2 are not the only ones getting lost at the bigger KLIA2 airport because AirAsia claims they are also losing something. 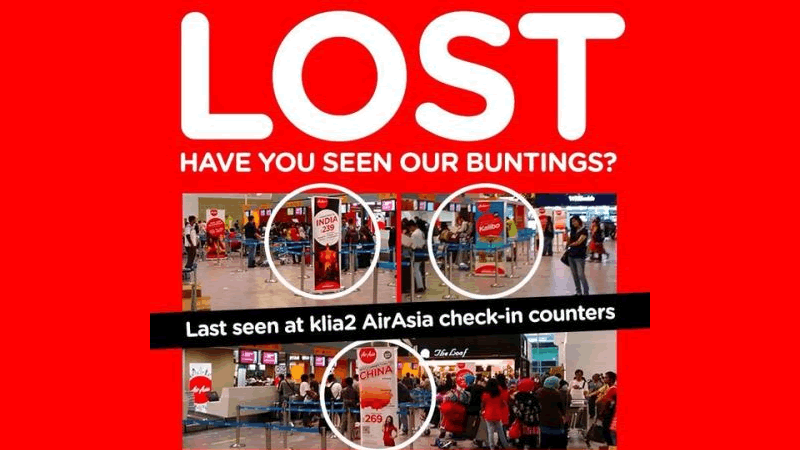 The Star reports that the budget airline has reported that their promotional buntings which are placed around the airport have gone missing, and they are looking for those responsible by asking the public to help look for them. According to The Star, 18 of AirAsia’s promotional buntings have been carted away, with some being last seen at the check-in counter. 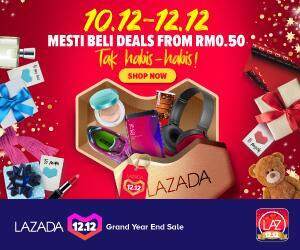 AirAsia also promised a ‘handsome reward’ will be given to those who return the missing items in addition to ‘countless gratitude and love’ from everyone at AirAsia. The airline has confirmed that they are victims of theft, and that the whole thing was not a marketing gimmick. Now here’s what we can’t help wonder about. KLIA2 is a state of the art facility, and has CCTV’s all over. Wouldn’t it be easier to just get the recording and zoom in to find the culprit? That said, despite the denial of the airline, we can’t help feel that this is just one of the many marketing gimmicks to draw attention. But of course, we do stand corrected, in which then the operators of the airport need to step up security to avoid such incidents to re-occurring.